Cover photo by Zoltán Perényi for Budapest Local. Getting off the tram in Jászai Mari Square we were all tired and hungry. Wandering the streets of Budapest’s Jewish Quarter for hours certainly worked up an appetite, and while my mind still digested all I learned on our Hungarian Jewish food tour with Context Travel, it was the perfect time for my stomach to taste and digest Jewish Budapest in a more literal sense of the word. 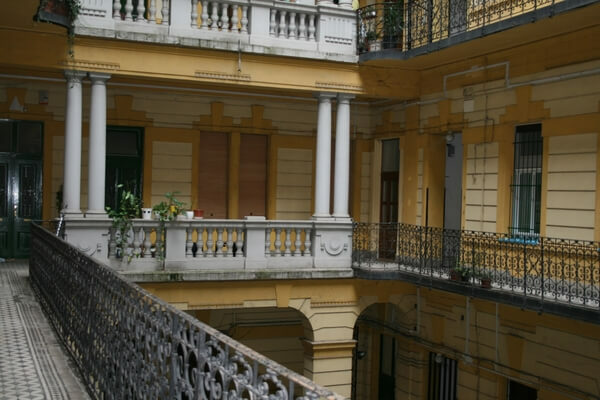 Moving away from the VII District, we entered a building on the fringe of the V District near the Danube. Budapest’s historic apartment blocks often house hidden courtyards each carrying a different character. Some are more classical, others are filled with gardens and some are art nouveau masterpieces. In this case, this one was particularly beautiful, following a more classical design of soft arches on the ground floor, punctuated by Ionic columns on the upper floors, encircled by wrought iron railings. After exploring the historical side of Budapest’s Jewish culture with Context Travel and we said goodbye to our informative Docent Szonja, our guide Anna with Taste Hungary took over the tour to entice us to taste Jewish Budapest’s culinary side in a local family’s home. Our host Maja, was the wife of the late Rabbi Tamás Raj. Her home was a museum full of curiosities, from antique books lining the walls, a mini-greenhouse enclosing plants to menorahs, silver candlesticks and beautiful items and silverware used to celebrate Jewish holidays and special occasion set inside glass-doored antique cabinets. 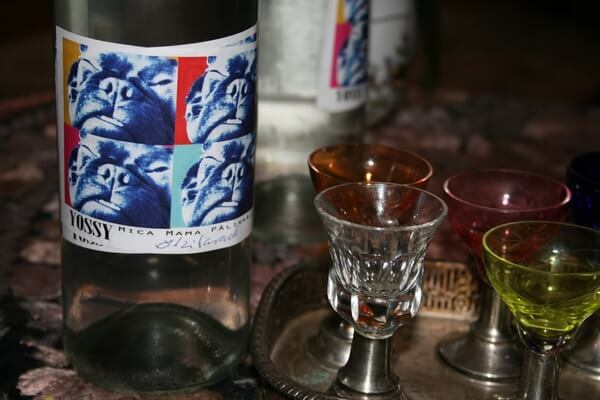 Seated in an area best described as a drawing room, with tapestry covered couches and armchairs, a small tray with an eclectic selection of glasses in a rainbow of colours, and two bottles of homemade pálinka, a traditional Hungarian fruit brandy, with bright pop-art style labels featuring the family dog. After warming up with a shot of quince and peach pálinka each, it was time to indulge in a true home-cooked Jewish feast, so we moved into the cosy dining room. We began with an appetiser selection of aubergine spread, foie gras and schmaltz served up with crusty bread, spring onions and crudites that satiated our collective hunger. Schmaltz is not just the Yiddish word for fat, but also means sentimentality, and is the soul of Ashkenazi Jewish cooking. 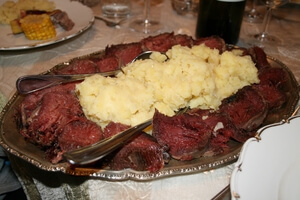 This rendered goose fat is not only used as a primary cooking as a fat in Jewish cooking, but as we found out today, is also used as a decadent spread on bread. It’s a bright yellow colour, and very rich and ideal with a strong white wine and a slice of red onion. 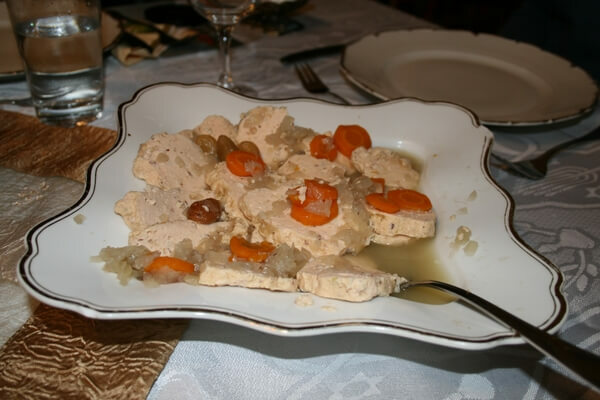 While the appetisers already began to fill up the hole dug into our stomachs from all the walking we had done, the following course, the gefilte fish, an Ashkenazi Jewish dish typically served on the Shabbat and holidays such as Passover, was a popular hit. Made with ground fish mixed up with spices, eggs, onion and matza crumbs and which is poached and served cold, the dish is served with a delicate broth made from fish stock garnished with reconstituted raisins and sliced carrots. The sweetness of the raisins not only accompanied the fish delicately, but also served as a pleasant follow up to the foie gras and schmaltz. Interestingly, this dish can be prepared in a variety of ways, from savoury to slightly sweet. The gefilte fish served up for our late lunch followed the sweet variety, which is a recipe originating from the Galitzianer Jewish community. It is said that communities from northern or southern East Yiddish are divided by what is known as the “Gefilte Fish Line”. Interestingly, on this tour, I notice a few divisions exist in Judaism, at least in Budapest, that are based on food. Like how shopping at one kosher shop in Budapest means you would never shop in another one. Gefilte fish is a pr ominent culinary feature on the Shabbat. The dish is convenient since you avoid having to pick out the fish bones while eating, which is one of the activities prohibited in the Shulchan Aruch, the Code of Jewish Law. Not to mention that since it is neither meat nor milk, fish is counts as parve, so it can be served with either. 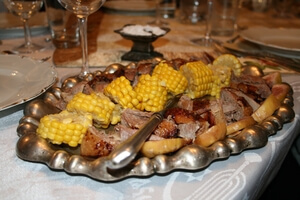 As we made our way through the first two courses, our Taste Hungary guide, Anna, told us about her own Jewish heritage. After having grown up in a strict Catholic household, she later discovered her family actually came from a Jewish background. Her Jewish grandmother had actually converted to Catholicism and the Jewish side was buried in the family history. Ever since Anna discovered her heritage, she has developed an interest in learning more about her heritage and Hungarian Jewish culture. The feast piled on and we were treated to roasted goose leg accented with spices with corn and figs, and roasted beef tongue with horseradish sauce, along with potatoes, aubergines and pickles. Just as we thought we couldn’t eat anymore, we were presented with desert. Flódni is a traditional Hungarian-Jewish cake made with apples, poppy seeds, walnuts and plum jam set between various layers of pastry. 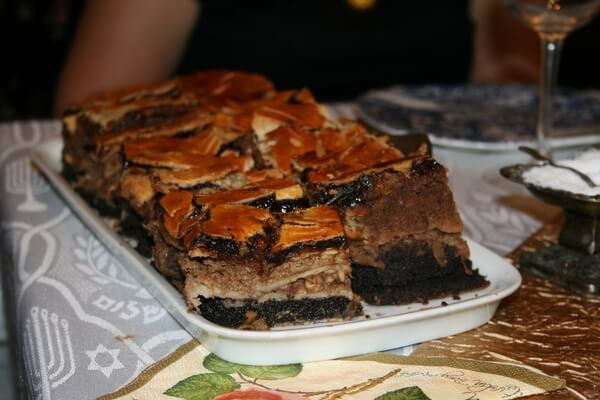 While this cake was a once popular Chanuka cake once found a favourite in Eastern European Jewish families in general, today it’s mostly found in Hungary. At lunch today, we were lucky that the cake we had was made by Maja’s daughter Rachel Raj, who owns Noé Cukrázda, said to be one best places in town where you can Flódni, and after trying her cake – I’m inclined to believe it. 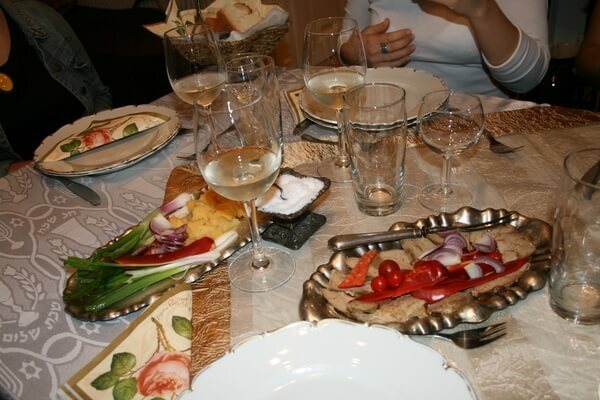 The meal was perfectly complemented by servings of Hungarian wine, beginning with Böjt’s Egri Csillag, a white blend from the Eger wine region made up of Hungarian grapes like Olaszrizling, Királyleányka and Chardonnay, served up with the appetisers and the gefilte fish, and a red blend by Heumann’s, a winery in Villány in southern Hungary, called Lagona, made with Cabernet Franc, Merlot, Blaufränkisch and Cabernet Sauvignon, went perfectly with the heartier meats. The desert was of course, rounded off with the famous Tokaji dessert wine which made a delicious, sweet ending to a long and informative day. After bringing ourselves back to life with a shot of strong coffee, it was time to slowly separate our ways, filled with delicious food and with a deeper knowledge of Hungarian Jewish culture. A Taste of Jewish Budapest is part one of my account of Context Travel’s “Authentic Flavors of Jewish Budapest, with Taste Hungary” tour. Part 1 of the tour took us through the history of the Jewish Quarter and the Jewish Community, where part 2 was a traditional Jewish dinner. Read about the Jewish Quarter in part one! All photos by the author, unless otherwise indicated.